Maybe it’s my cynical internet self who was not surprised to see pro-lifers advertising on Metro Transit, and I admit I did not pay the ads much attention until South House spoke out. The more I thought about it, the more annoyed I became that the ads were even allowed to be posted, and I debated a rare donation to the crowd-sourced counter campaign of pro-choice ads. My finger hovered on the button, then I left the page without donating. 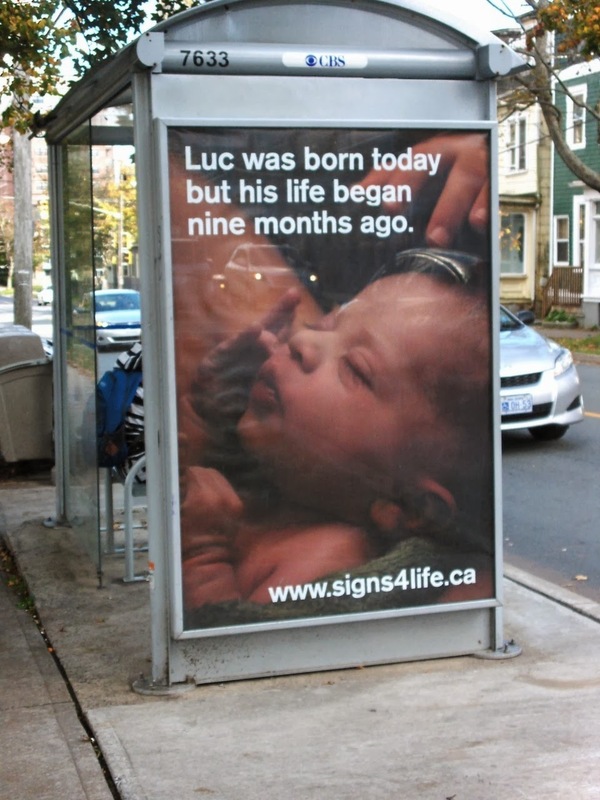 If you’re glued to campus or prefer your two feet to trundling busses, you may have missed the ad featuring a newborn that read “Luc was born today but his life began nine months ago.” The ad runs on every Metro Transit bus I’ve seen or ridden, and was posted for a time at many stops around the city. First, I have a problem with the text. It isn’t a vague and debatable statement, it’s a claim stated in a factual manner, one that is not supported by science or social discourse. The fact is that we have not come to an agreement on when life begins, and these ads are engaging in the American style of political opposition where each side has its own ‘facts’ and argues ad nauseum. This erroneous form of debate does not foster discussion as Signs for Life’s Stephanie Potter has claimed, but encourages people to be dogmatic about what they believe—in this case that life begins at conception regardless of what we might learn. I also have a problem with Metro Transit ducking responsibility. Just because the Canadian Supreme Court upheld our right to advertise on public transit in previous cases of controversial content does not indemnify whoever approved the ads from the responsibility of thinking. It’s not enough to insulate yourself from litigation; you have to ask yourself what is in the best interest of the public riding the bus. No, I don’t seriously expect Metro Transit to have had the capacity to pre-empt an ad campaign of questionable accuracy, but I wish to encourage them to have community experts weigh in on the accuracy of a given ad when it is of controversial nature. It is important to understand who this ad affects. The intention is clearly to promote moral and healthy choices for mom and baby, and the bus ads conceivably target young sexually active women. Yet everyone sees the ad, including males who have necessary voice in the abortion debate but nowhere near the same stakes. The ad as it stands also shames people who have already had abortions, sometimes for very important medical reasons, and we need to be sensitive to their struggle. Given my vexation with Signs for Life and my sincere desire to give pro-choice voices a chance to respond in kind, it is strange I was not compelled to donate to the cause. I can give two reasons: one, I have not seen an example of the content of South House’s ads, and I reserve my support for a well-made message that I personally endorse; two, Metro Transit stands to profit either way from advertising revenue, and I cannot endorse their negligence on the first ad even if additional ads lend balance. Nevertheless, I applaud South House for their pluck and for their solid message that informed choice is paramount and should not be denied to anyone. If they post ads in venues other than Metro Transit, assuming I agree with the tone and content of the message, you can bet I’ll put a few dollars behind it.